Ladies and gentlemen, it’s 94 degrees outside today. But if you look at my Pinterest feed you’d think it was fall. All I can see, as far as I look, are pumpkin recipes. Pumpkin spice lattes! Pumpkin pie! Pumpkin donuts! Pumpkin crafts! If you’re one of those people who likes to Pumpkin All The Things, then I have great news for you. It’s easy to grow and harvest perfect pumpkins—whether you want tiny, decorative pumpkins for a tabletop centerpiece or giant, prize-winning pumpkins like Almanzo grew in Farmer Boy. Or maybe you just want to grow your own jack-o-lanterns, and be ready for the Great Pumpkin. Read on, my friends…read on. You have a lot of choices when planning your pumpkin patch. First you’ll need to decide if you want carving pumpkins or eating pumpkins. Yes, you can carve the eating pumpkins and eat the carving pumpkins, but it makes more sense to choose the right pumpkin for the job. Next you’ll choose between giant pumpkins or tiny pumpkins. 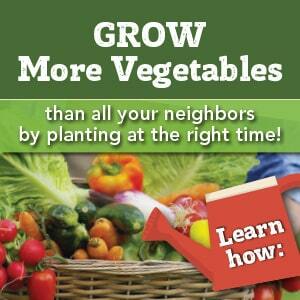 Or you can grow them all! 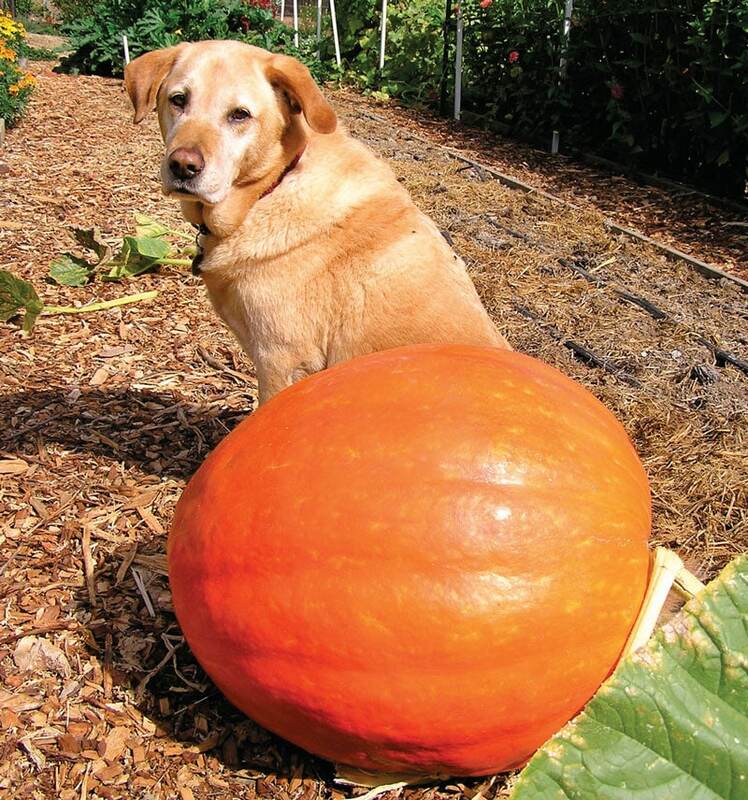 The kids will enjoy growing as many varieties of pumpkin as you can fit (garden dogs optional). Pumpkins like it hot! Give them full sun (a little shade is OK) and lots of water. Drip watering is best, both to save water and prevent rot. Mulch around the planting area for further water conservation, and to retain heat in the soil. Your pumpkins will need lots of space because the vines can grow up to 50 feet long. Plant your pumpkins in late May, when the soil is warm. Prep the soil with 2-4 inches of compost. I like to use my Mantis tiller because it’s lightweight and powerful. I lift it into the raised bed, buzz up the soil, and then I’m ready to plant. Make hills of soil about 4-6 feet apart. 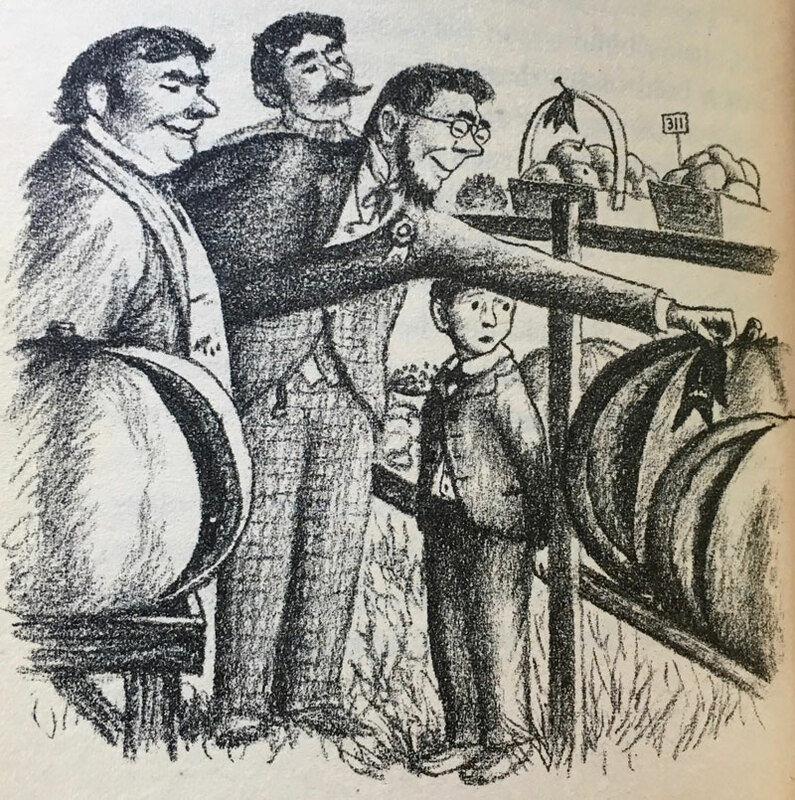 The hills will help the soil get warm faster, and you’ll remember where the seeds are planted (so you won’t pull the seedlings out with the weeds). Plant the seeds 1 inch deep and water carefully. I like to use a TP tube fort to protect the seedlings from cutworms. They’ll sprout in about a week—if you don’t see any growth after 10 days, plant another batch of seeds. 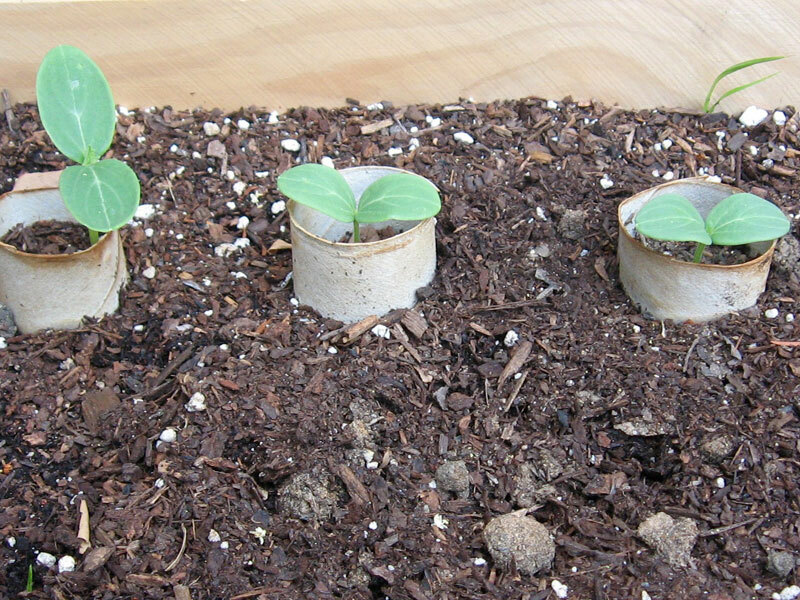 Yes, you can grow pumpkins in containers! Because they have a shallow root system, you’ll need a large pot. A 20-25 gallon container is ideal–I like these fabric containers called Soft Pots. 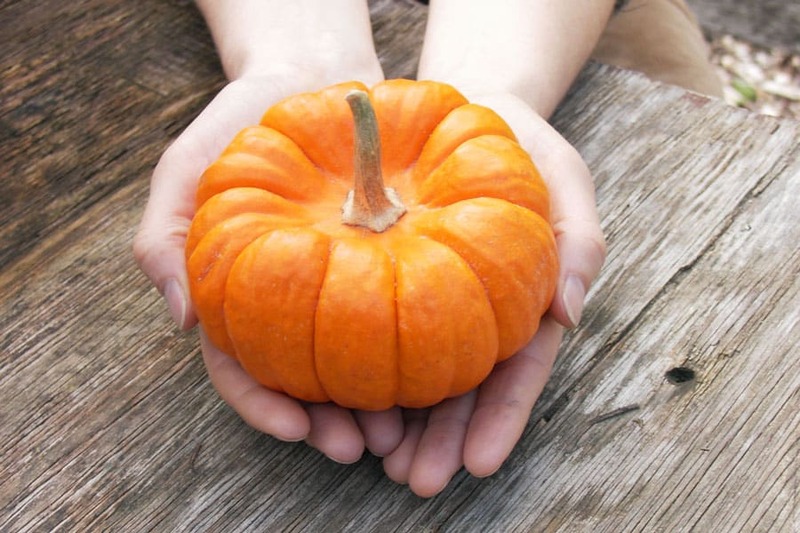 Be sure to monitor the soil and water frequently if you’re growing pumpkins in a container. After a few pumpkins have formed on the vine, cut off the end of the vine so the plant’s energy is completely devoted to the fruit. It helps to put a board or other support, like this gizmo, under the pumpkin to prevent rot. There are quite a few bugs who would like to chomp on your pumpkins—particularly squash bugs, squash vine borers, and aphids. You can wash the aphids off with a strong blast of water from the hose. Squash bugs are a little trickier to eradicate. My friends at The Free Range Life and Little Sprouts Learning have some great ways to get rid of these garden killers. 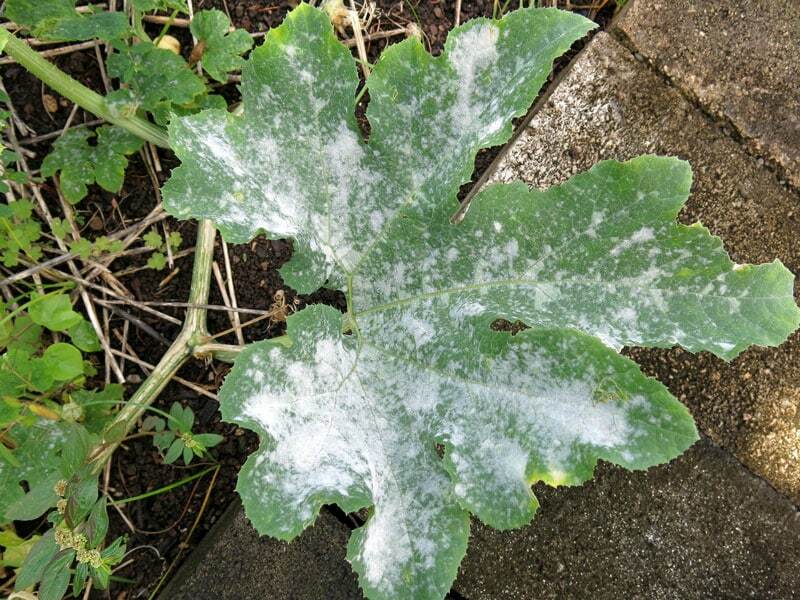 Watch out for powdery mildew, because once it takes hold it can be hard to get rid of. Prevent it by watering with a drip line (not overhead sprinklers) and removing some vines or leaves to promote air circulation. Don’t compost leaves with powdery mildew–throw them away so it doesn’t infect your entire garden. 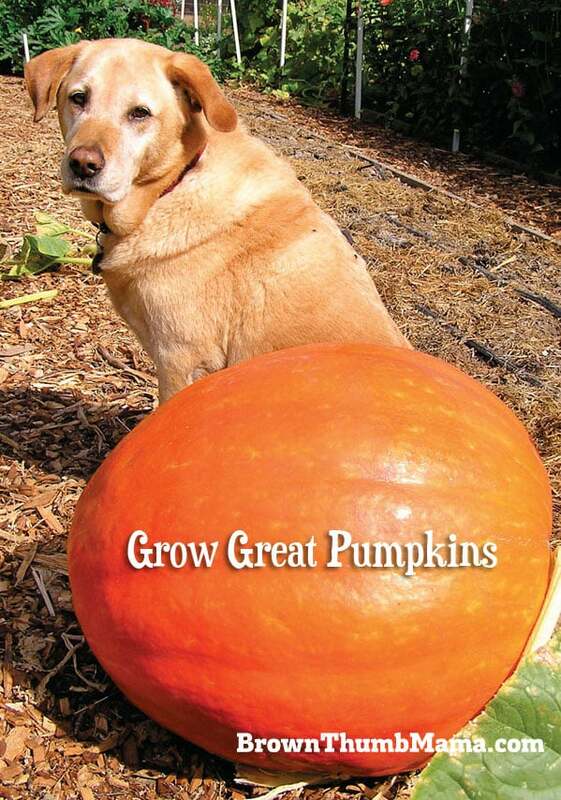 Good companion plants for pumpkins are corn and beans. Beans grow up the corn stalks, and together they provide a bit of shade for the pumpkins. In turn, the pumpkin vines shade the soil, keeping it moist, and keep critters away from the corn. Don’t plant your pumpkins near potatoes. I haven’t been able to find the scientific reason why, but when they’re planted together neither one grows well. 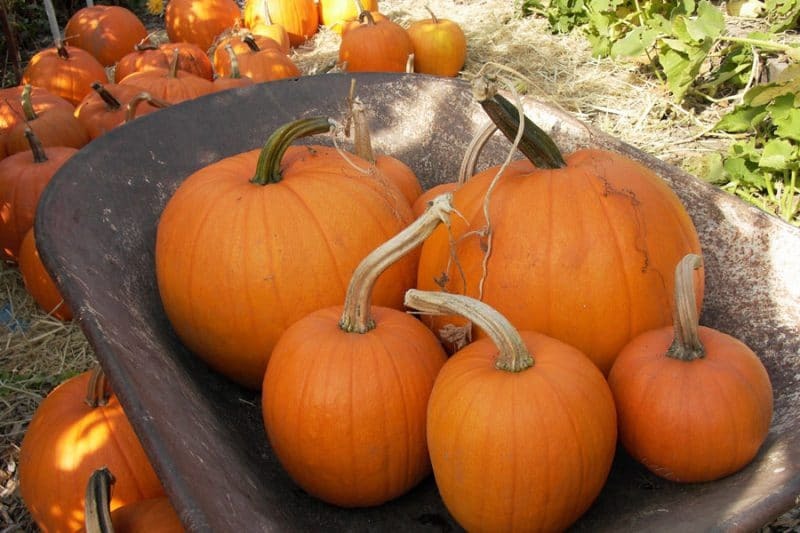 Pumpkins have a long growing season of 75-125 days, so you’ll harvest starting in late September or early October. How do you know if your pumpkin is ready to harvest? The rind should be a deep, solid orange and you won’t be able to pierce it with your fingernail. The vine may die back too, but the rind is a sure indicator. Cut the stem with pruners (these Felco pruners are amazing) and leave a long, 3-4” stem. Cure your pumpkins in the sun for 7-10 days and store them in a cool, dry place. If they’re left intact (not bruised or carved) they’ll keep for months. Are you a pumpkin carver, pumpkin eater, or both? Share in the comments!